Zachary, as a 7 year old 2nd grader, is still struggling to learn to read. 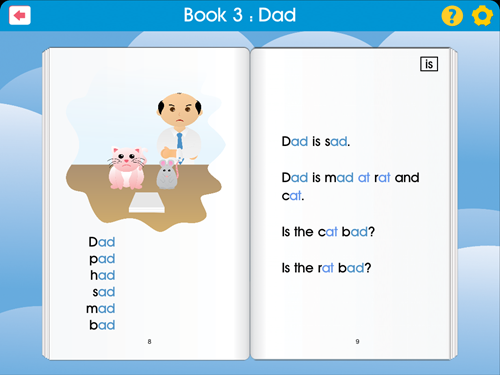 I have been looking into various interventions to help him and I was introduced to this app, Rhyme To Read, which was created by two educators – a learning specialist and a PhD in special education. 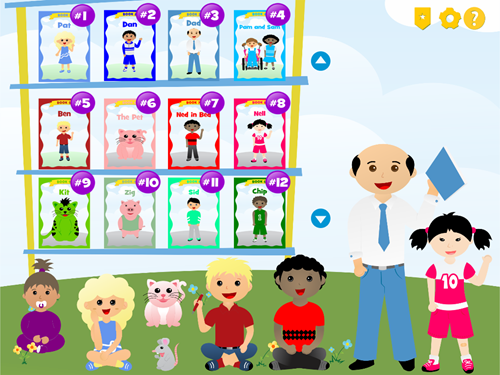 The app is not a game, but a beginning reading program of 20, color-coded, short vowel readers which are cumulative and organized by word families. I started reading the books together with Zachary and so far, they are maybe a bit easy for him, but I find that this gives him confidence in his abilities and we will definitely keep going through the books together. Rhyme to Read is a beginning reading program comprised of 20 short books. The program is carefully structured to ensure success for the youngest readers as well as students needing remedial work. Each of the twenty books, four per short vowel, highlights a specific word family (e.g., bat, cat, rat). Each family is color-coded throughout the series with a different color (e.g., bat, cat, rat). The color-coding of each word family encourages students to use visual similarities and differences to decode, a strategy employed by successful readers. The color-coding also helps students develop phonological awareness by providing cues for sound discrimination and categorization. Thirty-five common sight words are introduced and previewed the first five times they appear. Sight words are distinguished by black type. Delightful illustrations are used to enhance the storyline of each book. Zachary likes the way you turn the pages of the books in the app like you do in real books. He has not yet discovered that if you touch the words on the screen, they say the word for you! I like how the stories are built with rhyming words and incorporate sight words at the same time. I can definitely see this app as something I will use with Simon as well, once he learns the sounds that letters make. If you have kids learning to read or struggling to learn to read, I definitely recommend you check out Rhyme to Read! I received this app in exchange for my review. No other compensation was received and all opinions are my own.